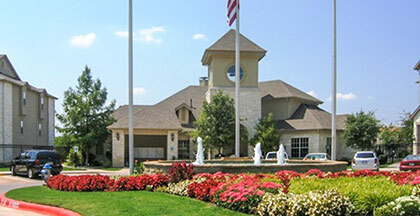 Visit Limestone Ranch at Vista Ridge on Facebook! At Limestone Ranch at Vista Ridge, you can experience true hospitality with a western flare. Here we offer suburban living convenient to Dallas, close to shopping, movies and restaurants. From the carefully designed floor plans to the thoughtful amenity package, we have taken every detail into consideration while preparing your new home. This new community is loaded with interior features and amenities that create an exceptional standard of living. Relax in the jacuzzi, play volleyball in our Olympic-size pool, take a walk along the canal, or workout in our state-of-the-art fitness center. Limestone Ranch offers you a chance to enjoy an urban lifestyle with neighborhood conveniences. Limestone Ranch has a variety of rent saving programs, such as our Senior Rewards Plan, Moderate Income Plan, and Preferred Employers Program.